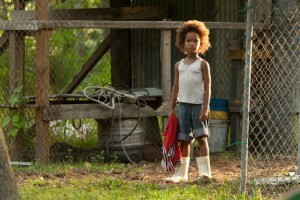 Director: Benh Zeitlin Starring: Quvenzhane Wallis, Dwight Henry Out now on DVD, Blu-ray In a forgotten but defiant bayou community cut off from the world by a sprawling levee, six year-old Hushpuppy exists on the brink of orphanhood. Her mother long gone, and her father Wink a wildman on a perpetual spree, Hushpuppy is left to her own devices on an isolated compound filled with semi-feral animals. She perceives the natural world to be a fragile web of living, breathing, squirting things, in which the entire universe depends on everything fitting together just right. So when a hundred year storm raises the waters around her town, her daddy is suddenly stricken with illness, and fierce pre-historic creatures awaken from their frozen graves to come charging across the planet, Hushpuppy sees the natural order of everything she holds dear collapsing around her. Desperate to repair the structure of her world in order to save her ailing father and sinking home, this tiny hero must learn to survive an unstoppable catastrophe of epic proportions.